Yesterday, CFAA made another attempt to prevent home growing of marijuana in rental units, when CFAA President John Dickie appeared at the Senate Standing Committee on Legal and Constitutional Affairs. Rather than focusing on rental buildings, we fell in line with the many groups who want all home growing banned. In particular, we supported the Centre for Addiction and Mental Health (CAMH), who earlier told the committee that “the current bill includes the provision for home growing and cultivation, as if this was a necessary endeavour to legalize cannabis and make legal consumption available. We categorically believe this is a misguided position.” CFAA agrees wholeheartedly that being able to buy marijuana in retail stores or by postal orders will make it readily available to both recreational and medical users. CFAA also made the point that whether or not home growing is allowed, the Bill needs to be amended to impose a limit on the amount of cannabis that can be stored in private dwellings, in addition to limiting possession in the public sphere, as the Bill does now. 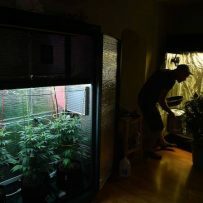 Even if the Senate does not change the Bill, there seems to be growing momentum among the provinces to ban home growing, as is being done in Quebec and Manitoba.